**Note: the measurements given below are for 1:24 scale. If you would like to make the cradle in 1:12, double the measurements (including the wood thicknesses). 1. Cut the four posts and side pieces of the body of the cradle as shown above left. 2 x side boards in 1mm wood (40mm x 20mm). 2. Carve the ends of the four posts as shown above right. 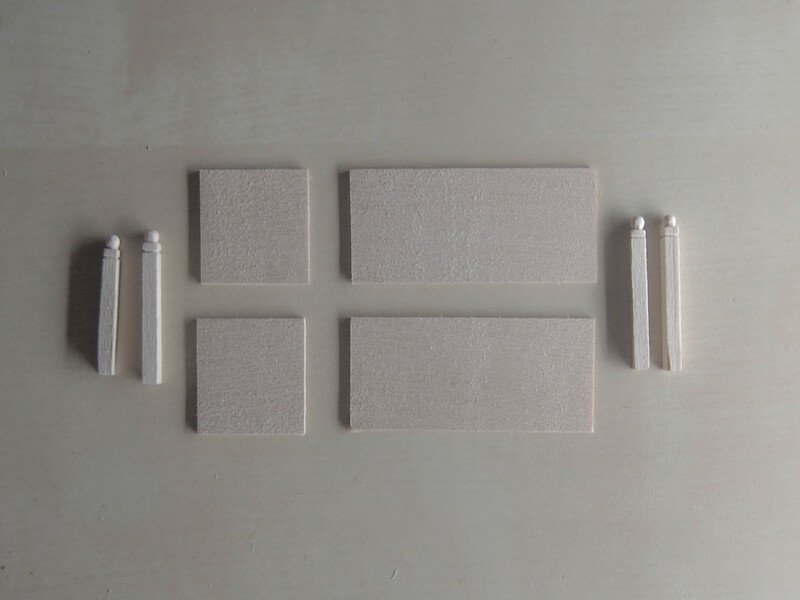 TIP: The posts don't need to be cut uniformly until you are about to glue them in. I usually leave them longer than needed during the carving process to allow for mistakes. 3. Shape the sides and ends how you wish. I chose to copy the pattern of an 19th century Australian colonial cedar cradle (pictured above right). Be sure to taper the edges toward the bottom by 2mm on all pieces because the sides slope out. 4. You must now cut the two rockers for the base. Shape these by cutting a rough outline first and then sanding in the details. This is more accurate method than just cutting. 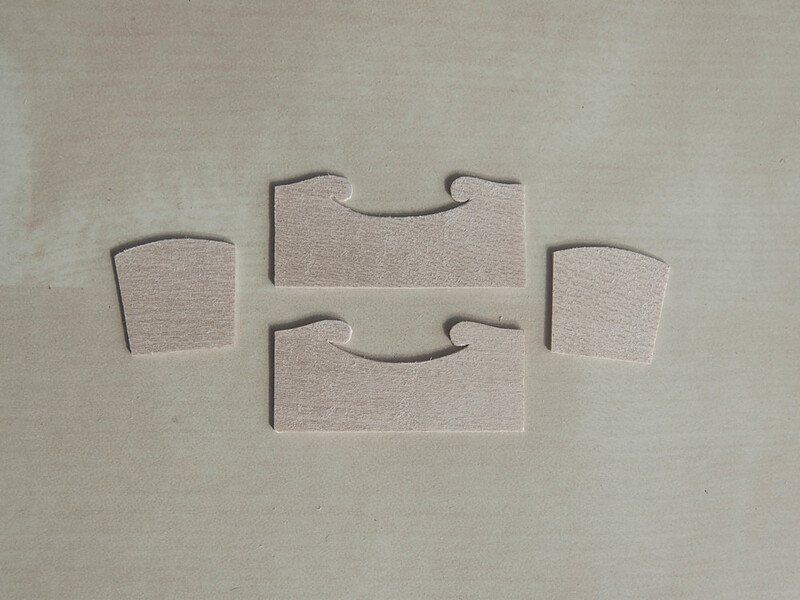 Above left you can see the two rough cut pieces (40mm x 10mm) and then how they have been shaped. 5. Cut the posts to a uniform length of 25mm. Round the base of the posts so they look neat. 6. Glue the posts to the end panels as pictures above right. 7. You must now glue the rockers on to the post bases. To do this neatly cut a small chink out of each of the post bases. Then glue the sides on so the body of the cradle is formed. 8. Cut the bottom of the cradle from 3mm wood (18mm x 38mm) and glue it in. 9. 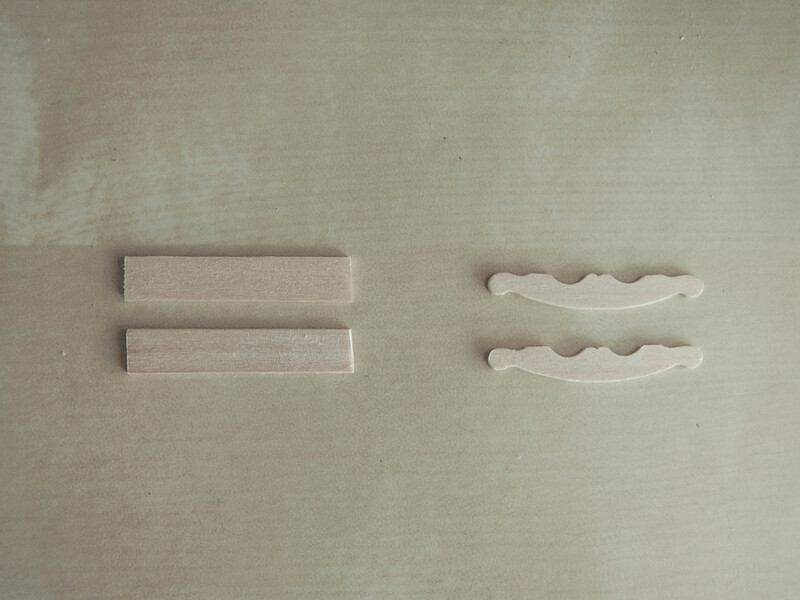 Cut a piece of the 4mm balsa and shape it with sand paper so that it is shaped like a mattress. Cover this mattress with fine cotton for sheets. 10. To finish the cradle, add a little bow as a flourish. Mine is red, but you might want to make it blue or pink! Sign up with your email address to receive updates when new tutorials are posted.